Terraria creator Andrew Spinks has confirmed with Rock, Paper, Shotgun that he is thinking about a sequel to his massive indie hit, but that the game is still quite a ways away. Spinks had originally wanted to move on from his creation to make other games, but the fans wanted to hear nothing about that. Many felt he still had unfinished business and undelivered promises, keeping him firmly implanted into his career roots. "I actually planned, when I first quit Terraria, to have been halfway through my next project by now," Spinks said in an interview with Rock, Paper, Shotgun. "But it just didn't happen. Instead, I decided to work on another update for Terraria to please the fans a little bit." Spinks continued to deliver the goods to his dedicated fanbase and ported the game to consoles for everyone to enjoy, earning scorn from his PC gaming loyalists. However, in a game that has nearly endless possibilities, what else can he deliver? 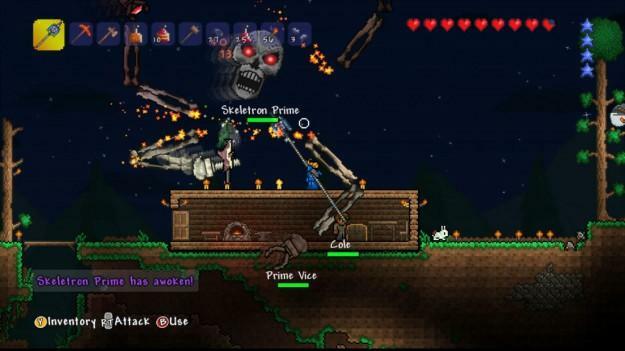 Terraria is not quite infinite yet, which is what Spinks says he wants to create in the sequel. "There's a lot of stuff I'm locked into with Terraria. The way loot works, the way character progression works. In Terraria 2, I really want to have infinite worlds so you're not just stuck to one world. You can travel anywhere. I want more biome diversity in that, too." Of course, being everything the first game is and then some will make his original creation obsolete. Spinks plans on updating a few more times before letting it pass on. As for Terraria 2, Spinks is looking for the same creative freedom, free from financial burdens, to make his second vision a reality. "When I made Terraria, I did it in four months, and I think I only paid, like, not very much – and that was just for the sound…So I'd like to be able to do something similar with Terraria 2. My personal preference is that I never be in a position where I need to get money to fund my projects." At least that means we might be spared a Terraria 2 Kickstarter. I don't think I could handle the pressure of that. The original is a fine game, but I seriously would like to see what else Andrew Spinks has rolled up his sleeves. Let Terraria go as a lovely little phenomenon and make something else amazing, not just a bigger version of the amazing thing you did years ago.